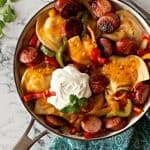 This delicious Pierogi Skillet combines the classic favorite potato and cheddar pierogi with freshly sautéed bell peppers and onions along with perfectly browned medallions of kielbasa. All the best flavors in one pan… dinner is served! In a large skillet, heat the olive oil over medium heat. Add the kielbasa and cook on each side until it begins to brown. Remove the browned kielbasa from the skillet and set aside. Leave the oil in the skillet. Add the bell pepper and onions to the skillet and cook over medium heat until softened, about 10-15 minutes. Remove from the skillet and set aside. Boil the frozen pierogi in water according to package directions; drain well. Melt the butter in the skillet over medium heat. Add the pierogis and sauté one side until they begin to brown on that side, then flip the pierogi. Once the pierogi have been flipped in the skillet, add back the sautéed bell peppers and onions and the browned kielbasa. 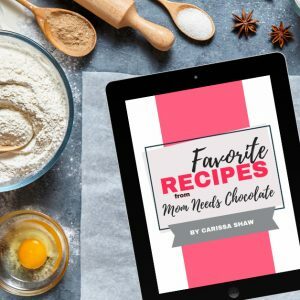 Use a spatula to gently toss everything all together. Sprinkle the shredded cheddar over the pierogi and kielbasa in the skillet. Cover with a lid and allow the cheese to melt. Remove the skillet from the heat. Serve with sour cream and a dash of salt and pepper if desired. Mrs. T’s makes a mini pierogi, and these would also be great in this recipe.